1.Prepare Lemon-Chive Sauce: In small bowl, stir together yogurt, chives, lemon juice and salt. Cover and refrigerate until ready to serve. 2.Prepare Zucchini Cakes: With largest holes of box grater, grate zucchini into strainer set over medium bowl. Toss zucchini with salt; let stand 5 minutes. Lightly press zucchini in strainer to remove as much liquid as possible; discard liquid. 3.Meanwhile, in separate medium bowl, with fork, lightly beat egg. Add flour, pepper and zucchini, and stir until well combined; fold in fried onions. Makes about 2 cups. 4.In large nonstick skillet, heat oil over medium heat. Drop zucchini mixture by 1/4 cupfuls into skillet to make 8 mounds. With bottom of measuring cup, press zucchini mixture into 3-1/2-inch patties. Cook 5 to 7 minutes or until browned, turning once halfway through cooking. 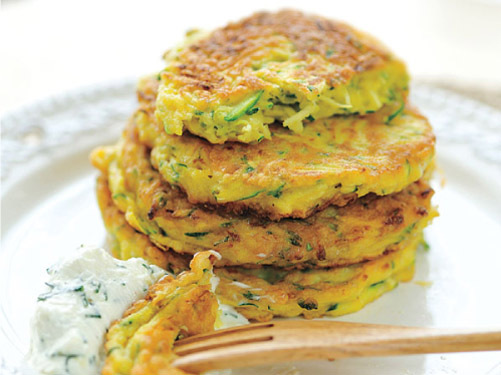 Serve zucchini cakes hot with yogurt sauce.